A grey old rainy cold day. Not exactly ideal weather for rambling—- unless it’s indoors around the internet. 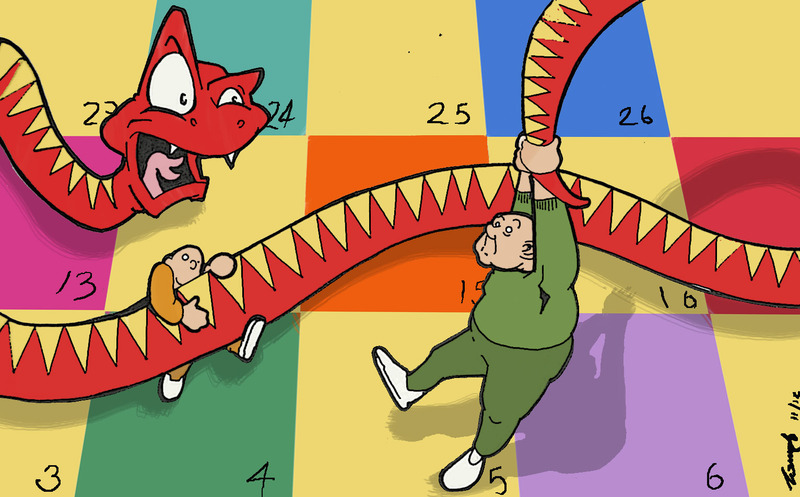 Somehow from nowhere I found myself thinking about snakes and ladders. Why I don’t know? I had a vague recollection of a cartoon that number one son, Tom had drawn for a blog I wrote years ago. Thanks to my WordPress search facility, I was able to unscramble the history of my rambling mind. There it was, a blog about social care entitled “Befuddled”. The sad thing is that five years on nothing has changed in terms of social care. Except things have got worse for many older people, who are overstaying their welcome in the NHS………. or paying a fortune in residential care homes……… or getting no support at all! The politicians continue to prevaricate. A Green Paper is deferred until next year and consultations are due to start in the new year. Presumably this will cover the same ground as the report commissioned in July 2010 by David Cameron and finally after a year was published by Andrew Dilnot in July 2011. Needless to say successive Governments continue to prevaricate on the issue. This entry was posted in SMILES and tagged "Rambling". Bookmark the permalink. That is the easy bit,? Now the difficult bit! The media, parliament, and the thought provokers are asking us to consider amongst other things-The plight of the african elephant in Kenya/Tanzania? ; Hospital bed blocking; rent a room for a more desirable person, unable to look after them selves upon discharge from hospital, who may not be able to be discharged to a nursing/residential/care home; The need to educate the school leaver coming into work to think of a pension scheme run jointly by the state and private industry? and then again party time and how one male or female has to be aware of sexual predators, looking for ‘favours- and self gratification. As John has stated nothing in 5 -8 years has changed since the commencement of his blog on “Bedfuddled”? A simple question; we are all older and maybe a little wiser? Can we influence the outcome in society within the UK and the wider world? Maybe these ‘pages of ‘Blogs’ are all words to be read and uttered? Maybe there is a message in there, not a grumble or down beat, but a Christian message to help ones fellow man/woman, not to just survive but live and trust in a society: In which we neither totally give, or totally take, but with our conscious subscribe too to help and support, where possible, and if unfortunate to be of taking help and support work towards the day with fulfillment to repay those who have shown kindness and compassion. WE all at times have a glass half full or half empty? This is the season to reflect, and make our new years resolutions! !